Eanswers.com is the PUP that uses misleading techniques to prevent removal. Use Reimage to locate malicious components and get rid of them faster than with uninstall instructions. A full system scan blocks virus reappearance and prevents traffic to malicious domains. Eanswers.com functions a website which is intertwined with closely associated with potentially unwanted programs (PUPs) and browser hijackers. IT experts discovered multiple versions. Nonetheless, despite attractive veneer, all of them contain serious security issues. Although the majority of these apps are available on official websites, for instance on Google Chrom Web Store, they usually try to settle on the system in the form of optional add-ons as well. These yahoo.search.com based domains look identical, and we can presume they have been created to help monetize their parent website. The Eanswers.com itself is available in English, Russian and Spanish languages. Thus, users from these countries should be aware of the problems that might be caused by this potentially unwanted program (PUP). One of the most annoying features of the hijacker is that it may arrive on the computer followed by additional components, the so-called browser helper objects  and prevent Eanswers.com removal from the browser. The users then have no other choice but to browse the web through these questionable search engines and be exposed to a greater scale of advertising than regular. Advertisers hope that an extensive display of ads will generate more the user clicks and make more advertising profit. You don’t necessarily have to take part in this business if you don’t want to. All you will have to do is run a scan of your system with Reimage, Plumbytes Anti-MalwareMalwarebytes Malwarebytes or some other professional and powerful antivirus scanner and the virus will be banished from your system in no time. Usually, such information is necessary for “improving services” and delivering personalized ads. However, it might also be shared with third-parties. The website works together with various advertising companies in order to generate more pay-per-click revenue. 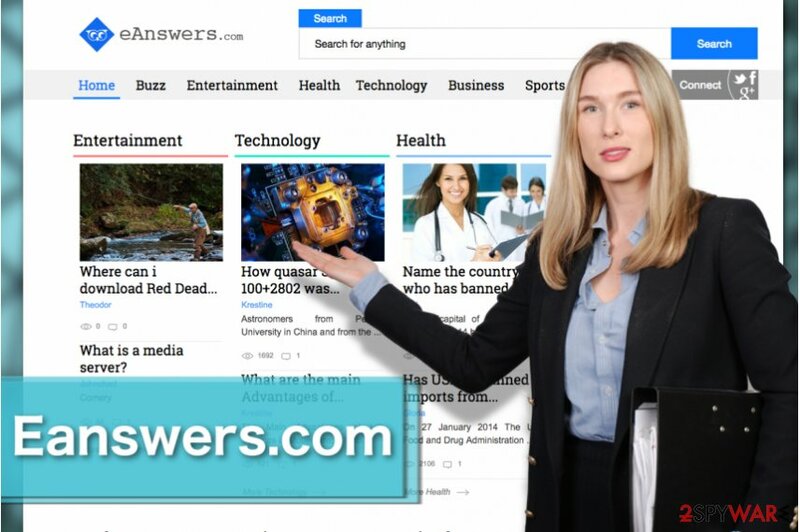 Here you can see the homepage of Eanswers.com. This is the first thing that users infected with this browser hijacker see when they open their web engine. Games.eanswers.com. This search tool spreads bundled with free applications. However, it is more likely to enter the system with the help of various games and entertaining applications. On the affected device, it alters browser’s settings and sets its domain as default search engine as default one. The hijacker usually displays ads that may redirect to questionable and potentially dangerous websites. Musix.eanswers.com. The hijacker becomes browser’s default search engine after careless installation of the freeware. It might install browser helper objects to prevent users from setting their preferred domain as default search engine. Nevertheless, it redirects searches to Yahoo; some of the results might be altered and full of commercial content. Thus, Musix.eanswers.com removal is recommended. Movix.eanswers.com. This PUP also spreads bundled with free movie-related programs that can be downloaded from various online sources. Apart from altering search results and delivering commercial content to the users, this search tool might collect various non-personally identifiable and browsing-related information and share it with advertising networks. Thus, soon affected browsers might crash from an excessive amount of online ads. Mps.eanswers.com. This version of the hijacker spreads with privateNet browser extension. Therefore, its installation will lead to undesired changes in the browser and redirects to suspicious websites. The developers of this extension are closely related to another questionable search engine – MyPrivateSearch.com. Both of them promise private search feature. However, they are used for online advertising purposes and barely benefit the user. BrowsePrivately. This browser extension is responsible for setting mps.eanswers.com as default search engine and homepage address. It also can change in-built search box and modify browser’s new tab. The add-on spreads via various freeware or shareware packages, so it can be installed in the browser during careless installation on the program. OnlineMusic. This browser extension usually travels with the help of various free programs. However, it might be also promoted on various questionable websites. After the installation, it alters browser settings. The hijacker might set default search engine to music.eanswers.com and modify browser’s new tab. Besides, it might read and change data on visited websites. Ext.eanswers.com. This domain is used for redirecting to Eanswers.com website. However, it might also redirect to various promotional websites. These activities are typically caused by an adware program. Therefore, it might also display numerous ads, pop-ups, banners and other commercial content on the browser. BetterMovies Home. This version of the browser hijacker is responsible for setting http://movix.eanswers.com as default browser’s search engine. It might also set the new home page that includes shortcuts to popular social networks and other websites. 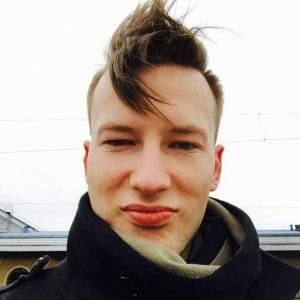 This PUP spreads using bundling strategy that allows getting installed on the browser without asking direct user’s permission. GoPlay Search. This PUP is advertised in software packages as a useful browser extension. After the installation, it might set default browser’s homepage to http://games.eanswers.com or musix.searchalgo.com/search/?category= that redirects search queries to Yahoo Search. The hijacker profits from user’s online activities and might prevent users from accessing their preferred search provider from the startup page. NJoy Music Search Plus. This browser extension is widely promoted in software packages as a useful tool for music lovers. However, after the installation, it takes control over the browser and alters its settings. The PUP is responsible for setting http://games.eanswers.com as default search tool and blocks users from accessing reliable search provider unless they get rid of this program. moviesJunkie Search. This Google Chrome extension is available on Chrome web store and theappjunkies.com site. However, it is widely distributed as an optional component in software packages. After the hijack, this movie-themed search engine alters browser’s settings, sets default search engine to movie.eanswers.com, displays suspicious commercial content and might collect information about users. musicJunkie Search. This version of browser hijacker is identical to moviesJunkie Search. The main difference is that it’s a music-themed search tool. According to its description on Google web store and theappjunkies.com website, it offers “FREE unlimited music, song, full albums, music videos.” However, it also replaces Chrome’s settings, sets music.eanswers.com as default search engine and might cause various browsing-related problems, such as redirects to high-risk websites. PrivacyZone Search. This potentially unwanted program travels with the help of software packages. It arrives on the system as a browser extension. After silent infiltration, it alters browser’s settings, changes browser’s new tab or/and homepage, and force people to use mps.eanswers.com as default search provider. The increased amount of suspicious ads is also expected after the hijack. Play.eanswers.com can be accessed on its official site. Despite that, it will replace your previous search engine if you add GamesCenter Search or ArcadeCenter Search plug-in to your browser. Though these extensions might seem useful, note that the new search engine will track your online activities and keep a record of visited search entries. Later on, such data might be traded with third parties and online advertisers. Excessive advertising is hardly a pleasant phenomenon. Movie.eanswers.com presents the same home page as the above-discussed sample of the PUP. You might also find this browsing tool if you attach MovieCenter Search, FilmsCenter Search, or VideoCenter Search to the browser. While this browsing tool will be present, movie-related pop-ups will disturb you once in a while. Note that such pop-up alerts might misguide you to potentially insecure domains. Eanswers.com is not the website that you would normally come across while browsing the web and decide to set it as your homepage. This program travels and gets inside the computers with the help of software bundling. This marketing technique allows malware developers to sneak in unwanted components into the computers during the software installation procedure. So when installing programs, you should always take a time to check the software bundle for additional options allowing to install undesired apps. If you have already suffered from Eanswers.com hijack, it might have happened when you installed freeware or shareware under Quick/Recommended settings. Keep in mind that these settings barely disclose about additional apps and installs them without asking direct permission. Thus, you should install new programs using Advanced/Custom setup and unmark all pre-selected programs, browser extensions, and other “useful” tools. 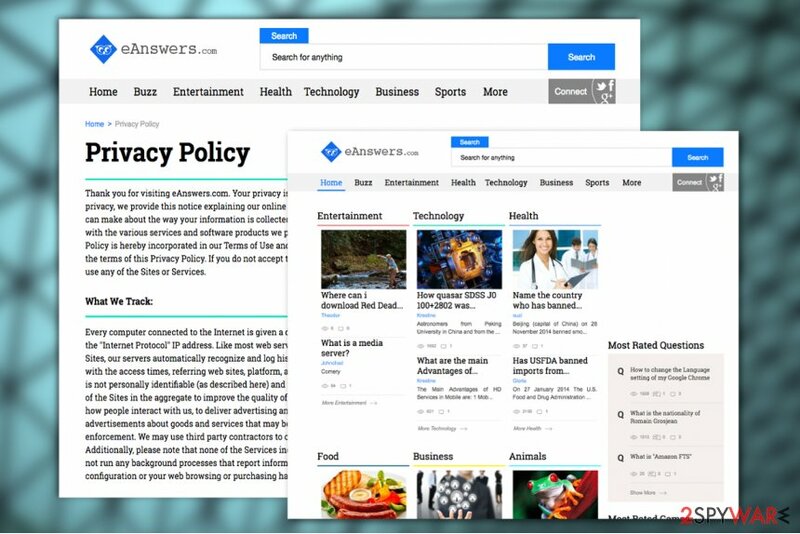 The first suggested way to remove Eanswers.com virus or any related items from your computer by scanning your device with the help of professional software. Install credible anti-malware that will clean your computer and protect from similar cyber threats in the future. The second method offers to do this job manually. By following our prepared instructions below, you need to investigate the system and delete all components related to the hijacker. Make sure that all necessary programs, browser extensions, files, browser helper objects and tracking cookies are terminated. Otherwise, eanswers.com removal won’t give any results. Here, look for Eanswers.com or any other recently installed suspicious programs. Wait until you see Applications folder and look for Eanswers.com or any other suspicious programs on it. Now right click on every of such entries and select Move to Trash. When in the new window, check Delete personal settings and select Reset again to complete Eanswers.com removal. Banish the PUP from your Microsoft Edge browser by deleting any unfamiliar components that you find on the browser's extension list. Once these steps are finished, Eanswers.com should be removed from your Microsoft Edge browser. Here, select Eanswers.com and other questionable plugins. Click Remove to delete these entries. Now you will see Reset Firefox to its default state message with Reset Firefox button. Click this button for several times and complete Eanswers.com removal. To make sure your Google Chrome is malware free, investigate the browser, delete the unfamiliar components and reset default settings to save the changes. Here, select Eanswers.com and other malicious plugins and select trash icon to delete these entries. Click Reset to confirm this action and complete Eanswers.com removal. Here, select Extensions and look for Eanswers.com or other suspicious entries. Click on the Uninstall button to get rid each of them. Here, look at the Homepage field. If it was altered by Eanswers.com, remove unwanted link and enter the one that you want to use for your searches. Remember to include the "http://" before typing in the address of the page. Now you will see a detailed dialog window filled with reset options. All of those options are usually checked, but you can specify which of them you want to reset. Click the Reset button to complete Eanswers.com removal process. ^ 4 trends driving software monetization. Machinedesign. Technology news. ^ LosVirus. LosVirus. Spanish website about computer viruses and malware removal. ^ Browser helper objects: the browser the way you want it. Microsoft. Learn to Develop with Microsoft Developer Network. ^ Bundled software. Computer Hope. The website about computers. ^ Antimalware (anti-malware). TechTarget. The global network of technology-related websites. This entry was posted on 2017-09-20 at 04:28 and is filed under Stealing programs, Viruses. You can quickly scan the QR code with your mobile device and have Eanswers.com virus manual removal instructions right in your pocket. How did you remove Eanswers.com virus?